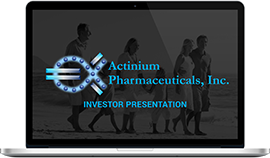 Actinium Pharmaceuticals, Inc. (www.actiniumpharma.com) is a New York-based biopharmaceutical company developing innovative targeted payload immunotherapeutics for the treatment of advanced cancers. Actinium's targeted radiotherapy products are based on its proprietary delivery platform for the therapeutic utilization of alpha-emitting actinium-225 and certain beta emitting radiopharmaceuticals in conjunction with monoclonal antibodies. The Company's lead radiopharmaceutical product candidate, Iomab-B, is designed to be used, upon approval, in preparing patients for hematopoietic stem cell transplant (HSCT), commonly referred to as bone marrow transplant (BMT). The Company is conducting a single, pivotal, multicenter Phase 3 clinical study of Iomab-B in refractory and relapsed acute myeloid leukemia (AML) patients over the age of 55 with a primary endpoint of durable complete remission. The Company's second product candidate, Actimab-A, is continuing its clinical development in a Phase 2 trial for newly diagnosed AML patients over the age of 60 in a single-arm multicenter trial.